At Christmas time there are very few front doors or homes not decorated with a welcoming wreath or garland. Over the last five years they have become very popular with not only high street florists are creating them but also well known store chains producing them in bulk for buying over the internet. They come in all shapes and sizes and after the Christmas tree; wreaths are the most popular festive design. The traditional ones are still the most sought after using, pungent ferns, holly, mistletoe, and ivy, brightened with ribbons and baubles, pine cones and dried fruit.Wreaths date back centuries to ancient Persia and Greece. Many countries and cultures worshipped evergreens such as the laurel or holly, believing them to represent immortality, so it became an obvious choice to create wreaths as a welcoming or reverence symbol. The Greeks in particular used to create them out of laurel to place on the heads or around the necks of champions. Certainly much symbolism can be placed on a Christmas wreath. The circle has no beginning or end which could represent the circle of life or even God’s never-ending love. Evergreens being used in winter could signify the birth of new life as trees begin to grow again, flowers start to appear. Decorating wreaths also dates back to ancient times. Just as we today use a number or a name to identify our house, the Roman in particular use to use wreaths to identify their houses. So at Christmas time when you put up your wreath, you can think of it as more than a decorative item. It also has tradition and meaning. 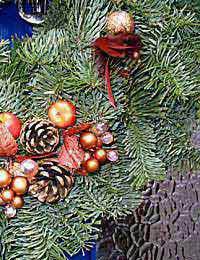 A mossed wreath is ideal as a Christmas decoration. In the UK moss is protected and can’t be taken from its natural habitat without a licence. It can only be supplied through a registered supplier. The moss mainly used is sphagnum moss. It usually comes in bags and should be fresh and moist. Other moss used is Reindeer or lichen moss. These days many florists use floral foam wreaths supplied by the wholesalers as mossing a wreath is very time consuming. They are very useful if you have to produce dozens of wreaths for Christmas. However if foam is not available or an unusual shape is required being able to moss a wreath is a valuable skill. Bring the wreath wrap back the other side of the wreath. Stretch the wrap over the frame anchoring with the German pins as you go. Decorate your wreath by wiring any decorations. I used feathers, beads and baubles and then wired them into the frame but you can use anything festive you like. Add the door frame hook and you are now ready to welcome people in for Christmas!